One of the main challenges a physician has is identifying what is the underlying cause of abdominal pain in a patient. Abdominal pain can be the result of many diseases, and one of these is the presence of kidney stones in the urinary tract. A common term used to describe the process of identifying a disease is a diagnosis. A physician requires a diagnosis to adequately treat patients to relief their pain and prevent further disease. But in order to do this, a physician require both, basic science training along with clinical experience. This is particularly important for diagnosing kidney stones because it is important to both identify the presence of stones and prevent the formation of these. Therefore, it can be useful to identify the risk factors associated with the formation kidney stones and diagnosing kidney stones. Additionally, it also useful to consider kidney stone diagnosis as a two-step process. First is the identification of the presence of any type of kidney stone in the urinary tract and afterward diagnosing the underlying causes of the presence of these stones. Risk factor will in the physician to help patients with risk of forming kidney stones prevent the disease. Risk factors will also be use full in the initial diagnosis of kidney stones in a patient with abdominal pain. Risk factors related to kidney stones disease can be identified with the initial process that causes the formation of kidney stones. Most factors will affect the supersaturation of salts in the urine. Supersaturation is when a salt´s concentration has increased and results in the formation of crystals which will add up and form kidney stones. Therefore, kidney stone risk factors can be divided into epidemiologic characteristics, the causes of supersaturation and other crystal forming conditions. Kidney stone has certain epidemiological characteristics which can aid the physician in kidney stone diagnosis and prevention. In general populations patients have a lifetime risk of developing kidney stones of 2-3%, making it a common illness. Also, many studies have pointed towards an increase in the incidence of kidney stone disease during the decades after the 1950s and later stabilized by the new millennium. However, some other studies provide evidence which states that there was no increase since the 1990s. Other authors have pointed out that the increase in the diagnosis of kidney stone disease might be the result of better technology and imaging studies which allow diagnosis in patients in asymptomatic kidney stones. There some risk factors which result in differences in populations such as gender, age, race, and family history of the disease, there is a greater risk of kidney stone disease in men that women (the lifetime risk of men is 12% and for women it is 6%). This difference can be seen also be observed in other studies which point out a 3:2 male to female ration. Age is another risk factor in the development of kidney stones. It has been reported in studies that after turning 20 the incidence of the disease increases until it peaks between the fourth and fifth decade. Afterward, rates remain constant. These age variations of risk occur in both, male and female patients. The racial risk of kidney stone seems to be higher in white population when compared to black populations. The Asian and Hispanic population have risk levels in between. Finally, patients with family history of kidney stone formation have a higher risk of developing kidney stone disease (2.5 times higher). It important that the risk of family history in rare cases can be associated with monogenic causes of kidney stone disease, however, these will be discussed in the risk factors associated with increased concentration of solutes. Most cases of with a diagnosis of kidney stones disease are not associated with such monogenic causes but still have family history risk. The mechanism by which these occur have not been identified and are theorized to be a result of polygenic variation with environmental factors related to risk. Among risk factors for kidney stones formation are the causes of supersaturation are low urine volume, increased quantity of solutes and variations of urine pH levels. Low urine volume can be associated with diverse causes which range from risk behavior to environmental exposure. One common cause of low urinary volume is higher temperatures. These can be the result of geographical location, seasonal changes, and exposure to activities that increase sweating. All of these stimulate the body to decrease water filtration and increase water re-absorption in the nephrons. Additionally, insufficient water intake can also lead the decreased urine volume and kidney stone formation. This decrease in volume results in higher concentration of salts, promoting crystal formation. Another way salt concentration can increase in urine is the increase of total solutes in urine. Risk factors that increase solutes are associated to increase kidney excretion caused by either higher serum levels which lead to increased kidney excretion. Serum levels of substances have been associated with diverse dietary and hormonal imbalances. Increased dietary ingestion of calcium, oxalate, magnesium, and vitamin C. The increase ingestion can either increase directly the serum concentration (calcium and oxalate) or indirect by increasing the absorption of the crystal forming solutes (magnesium) or metabolic degradation. Decreased ingestion of vitamin B6 has been associated with decreased degradation of oxalate, thus increasing oxalate renal excretion. Also, contradicting common beliefs the ingestion of coffee, tea, beer, and wine have been associated with reducing kidney stone risk in patients. Supersaturation has also been linked to pH variations. Variations in pH increase either by producing alkalic urine (calcium phosphate) or acidic urine (uric acid stones). The variation in pH increase supersaturation through specific chemical interaction related to the physicochemical characteristic of crystal-forming salts. Additionally, causes of pH can vary greatly from renal tubular acidosis to diabetes. All of this factors when considering pH variations as a risk factor for kidney stone disease can make understanding these and using them clinically difficult. The discovery of diabetes of risk factor occurred along with the identification of other metabolic diseases associated with kidney stone formation risk. However, because these metabolic processes have complex interactions with numerous organ system scientist have not figured out the mechanism. Additionally, it makes metabolic disease risk factors difficult to classify according to the previously mentioned kidney stone producing formation. Perhaps this could be because metabolic dysfunction affects diverse categories and cannot be placed in only one category. Other risk factors related to kidney stones are the decrease concentration of substances that inhibit crystal formation. Among these, there is the decreased urinary excretion of urine of citrate (hypocitraturia) or the synthesis of several proteins that have crystal formation incisory functions. Hypocitraturia has been studied in greater depth than protein causes. Hypocitraturia has been associated with numerous dietary and genetic causes. Regardless of the control of risk factor, patients can develop form kidney stones. In this moment it is urgent to initially diagnose kidney stones in a general sense, identifying the patient with kidney stones through the exploration of signs and symptoms along with the use of kidney stone testing. Patients developing kidney stones initially present with unilateral, diffuse, mild , and bearable flank pain it is relatively constant and unchanging. In this phase, the stone is found in the kidney and has not yet reached the ureteropelvic junction. Therefore, the length of this phase (about 30 minutes to 3 hours) is determined by the time it takes to reach the ureteropelvic junction. It is important to point out that during this phase the differential diagnosis because it does not provide enough information to distinguish the difference unless the patient also present referred pain to the lower back on the same side. Another thing to consider is that in rare cases bilateral pain can be the result of the presence of kidney stones on both sides of the urinary tract (usually kidney stones resulting from infections or those related to cystinuria). If a patient was sleeping sometimes this phase does not present with the mild initial symptoms because, during this period, the patient was not conscious. In the next phase, renal colic pain can be recognized. This phase begins as the kidney stones reach the ureteropelvic junction and the stone is subjected to peristalsis in the muscular ureters. Pain is described as intense and rhythmical. The intensity of the pain does not subside and is usually unbearable. Usually, this phase lasts about four hours. Like any colic pain, it alternates periods of certain relief with periods of maximum pain intensity. Additionally, depending on the location along the length of the ureter pain will be found in localized or referred to different parts of the body. If the kidney stone is found in the upper segment of the ureter pain is identified in the upper abdomen and the flank. If the kidney moves inferiorly into the middle and lower segments pain can be localized in lower and medial aspect of the abdomen and referred to the inguino-genital area. In the final phase, the patient can experience relief as the kidney stones pass the ureterovesical junction. This period is characterized by a brief and progressive relief of pain. Along the pain found in the abdomen pain, other signs might be identified. Some of the non-urinary symptoms include nausea and vomiting. These can manifest in all phases. Urinary signs and symptoms, however, are associated with the location of the stones. For example, stones found in the kidney can be a cause of hematuria in patient (either as microscopic or macroscopic hematuria). 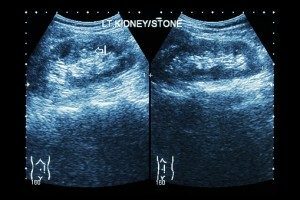 In the other hand kidney, stones in the distal ureter or the ureterovesical junction can manifest bladder instability, dysuria or alteration of urinary frequency. Another aspect to consider during the evaluation of the progression of the clinical presentation of kidney stones is the variations related to the chemical composition of kidney stones. The mechanism associated with chemical composition of stones will also determine the size of stones. If a stone does not travel through all of the urinary tracts, the patient might not progress from one phase to another. Therefore it is possible that due to the size of stones some patients will not progress through all stages. After the clinical evaluation of signs and symptoms and renal stones are considered in the diagnosis it is important to perform confirming kidney stone test. These tests include a urinalysis and diverse imaging studies. Urinalysis in kidney stone patient can provide vast and useful information. Kidney stone patients regularly present hematuria in the urinalysis, usually as microhematuria. Additionally, the pH and the presences of crystal might aid in the identification of the chemical composition of the stone. For example, alkaline urine can be a product of urinary tract infection while acidic urine can be associated with uric acid stone formation. Additionally, urine cultures should be performed to study urinary tract infection in patients. Additional to the urinalysis , imaging studies are part of the essential kidney stone test. Even though the clinical history of the patient will determine the diagnosis and initial treatment, without imaging studies a complete diagnosis cannot be done. Therefore, the physician must perform image studies to confirm the size and location of kidney stones. The imaging studies a physician can order include the abdominal ultrasound, plain-film radiography, intravenous pyelography and non contrast helical computerized tomography. The choice of imaging will depend whether a patient belongs to one of the following patient population, gynecological and obstetric patients, patients with radiopaque stone history and patients outside the previous categories. The abdominal ultrasound has a high specificity (97%) and a low sensibility (19%), however it is readily accessible and is needed in gynecological and obstetric patients. The abdominal ultrasound is used in gynecological and obstetric patients to prevent radiological exposition in pregnant women and the identification of possible gynecological disease with similar presentation (it is important to recall the lower risk of kidney stone formation in women). Plain-film radiography has a lower specificity (70%) but a higher sensibility (50%) when compared to the abdominal ultrasound. It is important to recall the chemical composition of stones because only some stones will be able to be observed in plain-film radiography. Both types of calcium stones (calcium oxalate and calcium phosphate) can be observed as in radiography films. However, pure uric acid stones, cysteine stones, and magnesium phosphate stones are not usually radiopaque and are not easily identified. In general, the plain film has limited capacity to visually present kidney stones but is easily accessible to physician across the globe. The other studies, non-contrast helical computerized tomography, and the intravenous pyelogram have a greater utility in the diagnosis of kidney stones. The first can be identified as a detailed structural imaging test, while the second as a thorough functional imaging test. The sensitivity and sensibility of a computerized tomography are quite high (95% and 95%). Additionally, it can provide with information on non-genitourinary conditions. However, this imaging test is quite expensive and is not as easily accessed. The intravenous has a sensitivity of 72% and a specificity of 92%. Even though these values are lower than the tomography study it is useful because of the evaluation of renal function. As a result of a physician’s effort into studying the risk factors and the clinical manifestation of kidney stones the diagnosis of kidney stones is possible. Later, with help of the several kidney stone testing a diagnosis can be confirmed with greater details. To finally treat the kidney stone found in the patient with appropriate treatments and relieve the pain. However, further studies must be made. Usually, these include diverse molecular biology, biochemical and hormonal test to evaluate the possible causes of the formation of the stone. In the second part of the diagnosis of kidney stones it is possible to prevent the recurrence of stone through appropriate medical health measures. Regardless of scientist have not fully discovered the mechanism by which stones are formed, an appropriate etiological diagnosis of kidney stones can provide one of the best tools to prevent the formation of kidney stones.